Abstract: Developing targeted therapies based on patients’ baseline characteristics and genomic profiles such as biomarkers has gained growing interests in recent years. Depending on patients’ clinical characteristics, the expression of specific biomarkers or their combinations, different patient subgroups could respond differently to the same treatment. An ideal design, especially at the proof of concept stage, should search for such subgroups and make dynamic adaptation as the trial goes on. When no prior knowledge is available on whether the treatment works on the all-comer population or only works on the subgroup defined by one biomarker or several biomarkers, it’s necessary to estimate the subgroup effect adaptively based on the response outcomes and biomarker profiles from all the treated subjects at interim analyses. 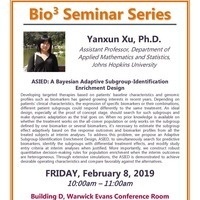 To address this problem, we propose an Adaptive Subgroup-Identification Enrichment Design, ASIED, to simultaneously search for predictive biomarkers, identify the subgroups with differential treatment effects, and modify study entry criteria at interim analyses when justified. More importantly, we construct robust quantitative decision-making rules for population enrichment when the interim outcomes are heterogeneous. Through extensive simulations, the ASIED is demonstrated to achieve desirable operating char- acteristics and compare favorably against the alternatives.